TRYON, North Carolina, April 21, 2018–Adrienne Lyle debuted Harmony’s Duval, the 10-year-old American-bred KWPN gelding at Grand Prix, capturing two national classes at the Tryon International Equestrian Center where she was competing Horizon in the World Equestrian Games test event. Adrienne and Duval won the Grand Prix Saturday on a score of 70.380 per cent, with 5* judges Katrina Wüst of Germany awarding 73.261 per cent and Anne Gribbons of the United States 67.500 per cent. On Friday, the pair were awarded 73.478 per cent by national judge Lisa Schmidt. 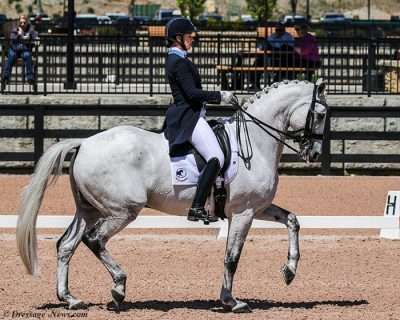 “I was thrilled that we were able to ride in front of two CDI judges, and was very happy with our performance and the score, especially for being his first show doing Grand Prix,” said Adrienne, 33 years old of Ketchum, Idaho. Adrienne, a 2012 Olympic rider on Wizard, competes Salvino, ranked No. 19 in the world that she began riding Big Tour a year ago, and Horizon that she showed in his first CDI Grand Prix five weeks ago. She is on the United States Elite squad with Salvino and is pre-Elite with Horizon and plans to take both to Europe this summer as she seeks to be on the American team for the World Equestrian Games at these show grounds. Bob McDonald, the husband of Debbie McDonald, Adrienne’s long time coach, scouted Duval (Rousseau x Riverman) at Harmony Sport Horses in Kiowa, Colorado. Adrienne first competed Duval at training level in 2013 then fourth level three years later. The pair began international small tour a year ago. “He is now owned by a syndicate of absolutely wonderful people from the Pacific Northwest,” said Adrienne who grew up in the area. She hopes to move Duval up to CDI Grand Prix during next winter’s Global Dressage Festival in Wellington, Florida. Correction: The national judge to award Adrienne and Harmony’s Duval 73.478 per cent was Lisa Schmidt, not Sara Schmitt.